At TJ Self Drive, we not only offer Van hire in Calne, Frome and beyond, but we also have a large truck available for hire. 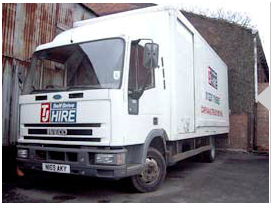 The truck is perfect for large scale removals and a range of large goods. The truck is 7.5 tonnes and has a tail lift. This allows for easy transport of heavier goods which you might not otherwise be able to transit. The tail lift on our truck can lift items as heavy as one tonne, ideal for moving large furniture, large kitchen and bedroom items, and more. If you do not feel comfortable driving our truck, then please let us know and we will be able to provide a driver for you. Our drivers are happy to drive to a number of different locations in and around the UK and even Europe. Any driver who would like to hire our truck must have a valid drivers license at the time of hire, and must be aged between 21 and 70. You will also need additional I.D. (e.g. a utility bill with you current address on). We have full vehicle insurance on our truck, but this doesn’t cover contents, punctures, tyre damage and so on. The cars we have on loan have an excess of £500. For Truck or Van hire in Calne and beyond with TJ Self Drive Hire, drivers between 21 and 25 years of age must have a clean drivers license with no accident history. For more information on Van Hire in Calne with TJ Self Drive hire, please do not hesitate to get in touch with us today. We look forward to hearing from you.